Club Mari’s — home of perhaps the city’s only truly authentic Japanese karaoke bars — is so well hidden that most locals likely have never even heard of it, let alone sipped sake there or taken up the mike and belted out I Don’t Want to Miss a Thing by Aerosmith or Missing You by Kubota Toshinobu, two of Japan’s hottest karaoke songs. While most of the mall’s restaurants and shops are bustling spots filled with paper lanterns and Japanese artifacts, Club Mari’s is just the opposite. It’s dark, discreetly lit by battery-powered candles, brass sconces and mood lighting moving around on the ceiling. It also has two bars. 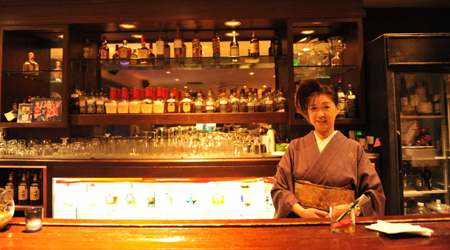 One is sleek, staffed with a bartender and equipped with a handsome back bar stocked with global and Japanese liquors. The second has no bartender but is lined with black leather and chrome barstools and has a big screen TV. The rest of the room is clustered with muted olive green sofas and ottomans arranged around low wooden tables. An upper level has similar seating and another television screen. Opposite the bar is a small stage for karaoke buffs who crave the spotlight. Walls are paneled in bamboo and hung with small iconic San Francisco paintings featuring cable cars in oversized gold frames. Club Mari’s is sedate, not flashy. During the week, the crowd is 30 and up; younger clubgoers attend on the weekends. There’s no dancing, no DJs, no psychedelic digital light show. And management insists it’s not a hostess bar where young Japanese lovelies sit with lonely gents, offering companionship and an ear while plying them with drinks and collecting a commission on every pour. It’s simply the real deal. For example, in Japan it is customary to name mize shobai or “water trade” establishments after the owner. 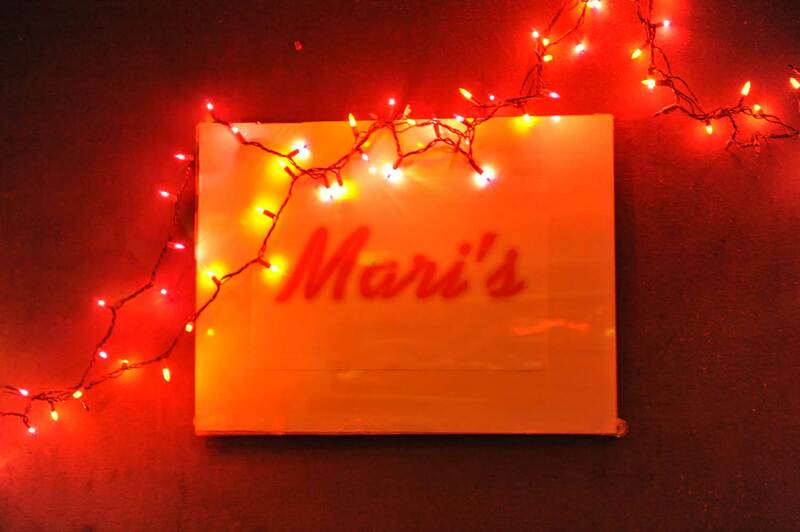 Club Mari’s is indeed owned by a petite, high-spirited, delightful but no-nonsense woman called Mari who won’t say whether it’s her first or last name. “Just Mari is fine,” she says with a smile and a dismissive wave of her hand. More saloon owners could take a lesson from her. Club Mari’s is open seven days a week from 8 p.m. to 2 a.m. Mari arrives an hour before opening and stays until closing every day, meeting new customers, usually as soon as they walk in the door, greeting and pampering regulars. She does take a two-week vacation every year, though. Born in Osaka, Mari came to San Francisco at 24 to learn English. She married, had a son and divorced. To support herself and her child, she opened a Japanese bar — the first Club Mari’s — downtown on Cyril Magnin in a tiny space that’s now a Starbucks. In 2005, she expanded to Japantown, with no fanfare. Mari, who apparently relies on word of mouth and small ads in Japanese newspapers, isn’t out to pack her club to the rafters. There are few Americans or other westerners in the place, but everyone is made to feel welcome. Mari, who wears a kimono every day except Sunday, when she “relaxes” in a black business suit with one or two pearl kanzahis in her hair, is a shrewd businesswoman. Admission to sit on one of the sofas and join in the karaoke is $20 a person. Every third Friday, there’s a Halloween party. Partygoers — and regular customers — come from as far as San Jose and Sacramento. Japanese baseball players join in when their teams come to town. Like most bars in Japan — and hot dance clubs worldwide — Mari’s has a bottle menu and the spirits are all premium labels, but pricey. Prices start at $170 for a bottle of Chivas Regal, Jack Daniels, Seagram Crown Royal and Johnnie Walker Black Label. They move to $230 for a bottle of Yamazaki 12-year-old Japanese Scotch and $260 for a bottle of Patron tequila all the way up to $1,200 for a rare 25-year-old Macallan. Martell Cordon Bleu Cognac, Champagnes and wines are also sold by the bottle. 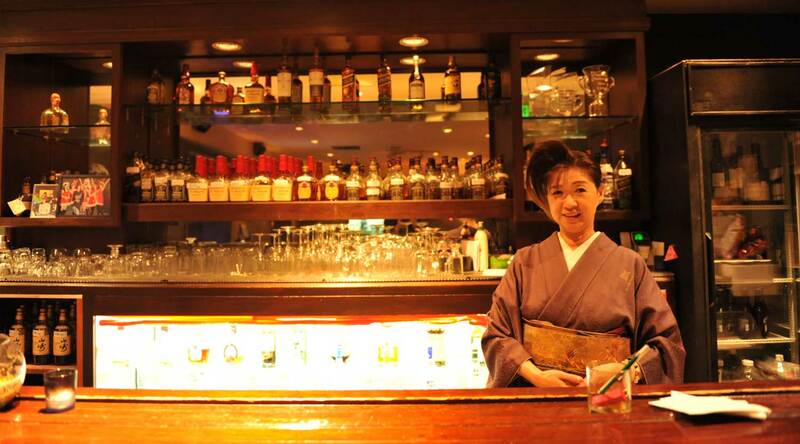 Club Mari’s, in the time-honored tradition of Japan’s bars, will store your bottle until your next visit. Everything with a bottle price is also sold by the glass and the tariffs are either lower or match the better neighborhood saloons. Chivas, Crown Royal, Stoli and Absolut are $10 a glass at the bar and from $1 to $2 more if you order at a table. Sapporo on draught is $7 at the bar and $8 for table service. Sake lovers have plenty to choose from here and it’s served in two sizes: 100 ml for $6 and 210 ml from $12 up to $28. Those who sip sometimes also hear faint sounds of another karaoke bar wafting in from down the hall. Four years ago, Mari realized she was missing out on a potential market of Japanese tourists and Americans who did not want to pony up for her sophisticated club scene. But they definitely wanted to warble to Japanese and English music. 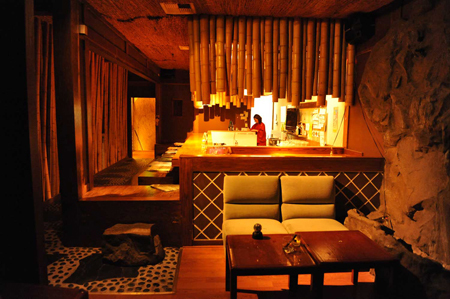 Her answer was Mogura — a casual room with bamboo hanging from the ceiling, long benches with thin Japanese mats, a TV screen and two microphones so couples can do a duet. Mogura shares a kitchen with Club Mari’s and the same menu. Bartender Ken Mamizuka, who hails from Tokyo, described the small plate dishes as “traditional homestyle Japanese food your mother or grandmother would make.” The fare on the small menu includes fried chicken, salted minced squid and rice balls, among other offerings. Mogura, which has its own door out to the mall, doesn’t whack your wallet. A karaoke song is $2 plus a one drink minimum which could cost $6 or less. Mogura is closed Sunday and Monday.